Since I was unable to make it for this podcast (or just unwilling to endure being called Landru for the entire show), I figured I would throw in my two cents regarding this episode for posterity’s sake. And don’t worry, you can throw a few Landru remarks in my direction when we get to “A Wolf in the Fold” since the actor who played Landru is in that episode as well. First, aside from being a vehicle for Kirk & Co. to meet up with Regar and the “underground”, at the time I didn’t see a point to the whole Red Hour concept. Granted the scenes played out well on screen, but isn’t there another way this meeting could have taken place (member of the underground obviously seeing strangers in town just strikes up a conversation?). I do like the possible explanation Brian gave during the podcast. I hadn’t thought of it that way. As to this underground movement, apparently everyone travels in threes. I find it very convenient that the third member of this triumvirate (Marplon?) 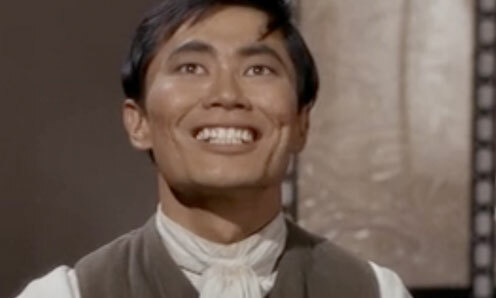 just happens to be the guy responsible for turning Kirk & Spock into mindless zombies. Gotta love those coincidences! The Lawgivers appear to be controlled by Landru but are they living people? Computers? Both? Possibly an early form of Borg collective maybe with Landru being the “queen”? I did have to laugh at how, when the crew are in the dungeons and the Lawgivers are leaving, nobody attempts to escape! The lawgivers do not move fast, as we’ve already seen, and the dungeon doors are not exactly slamming shut. Did Kirk think escaping to be futile? Overall, I just didn’t find this a very entertaining show. I think there was potential but it just fell flat for me. I hate shows that rely on coincidences and there are too many at work here.